Rejoice! 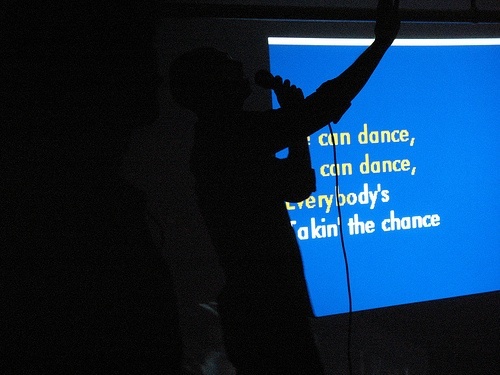 We’ve added some new songs to our karaoke library! Including some recent popular hits! Including some Lady Gaga! But, be warned, there is not enough Lady Gaga for everyone to perform there own Lady Gaga song. So, you know, maybe you want to show up on the early side, to make sure you get to sing the Lady Gaga? Or maybe everyone will just have to sing along together to Lady Gaga?! Yes, that’s better. The Swap Meet Gaga Chorus! Let it be so. Swap Meet is an aperiodic celebration of the cultural commons organized by The Royal Academy of Nuts+Bolts and Superbunker. We have a poorly-organized music exchange, enthusiastically amateur karaoke, and an overall Betalevel open house with snacks and drinks for all. Here’s the house karaoke list (note: new songs not yet added to list).